KINGSTON, Jamaica, Sporting Alert – The following are the starting lists for the 2016 Jamaica International Invitational inside the National Stadium in Kingston, on Saturday evening. You can watch live streaming coverage of this meeting on 1spotmedia.com, starting at 5:00 pm EST. Local channel TVJ will also broadcast the action. The IAAF World Challenge meeting will be missing a number of its initial stars who pulled out of the competition because of injuries, but there will still be a lot of great talents on show this weekend. Among the superstars down for action are World and Olympic champion Shelly-Ann Fraser-Pryce, who will go up alongside Bahamian world 400m bronze medallist Shaunae Miller in the women’s 100m. Another Beijing world championships 400m medallist, Shericka Jackson of Jamaica, will also step down to take on Fraser-Pryce in the half-lap. 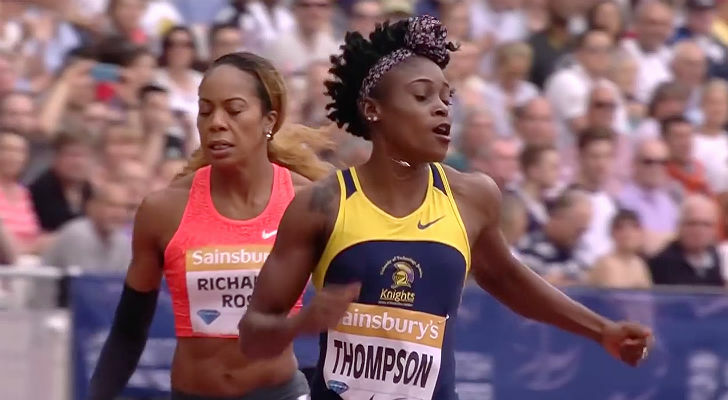 The women’s 100m field is also loaded with talents, with Jamaica’s world championships 200m silver medal winner Elaine Thompson taking on American Jenna Prandini, who has already clocked 10.95 seconds this season. Jamaica’s world championships relay gold medallist Natasha Morrison, as well as 2008 Olympic silver medallist Kerron Stewart, Trinidad and Tobago’s Michelle-Lee Ahye, USA’s English Gardner and local star Jura Levy will also face the starter. Despite the withdrawal of Sanya Richards-Ross, the women’s 400m is still offering some juicy matchups, with Jamaicans Stephenie Ann McPherson, Novlene Williams-Mills, Christine Day and Anastasia Leroy leading the local charges. They will be going up against 2008 Beijing Olympic champion Christine Ohuruogu of Great Britain and IAAF Diamond League winner Francena McCorory of USA. In the men’s sprints, Americans Tyson Gay and Mike Rodgers and St. Kitts and Nevis national record holder Kim Collins will line-up against a very young, but talented group of Jamaicans, including Kemar Bailey-Cole, Julian Forte and Oshane Bailey. Former world 100m record holder Asafa Powell heads the list of entries in the men’s 200m, and he will be hoping to run much quicker than his 20.51 current season’s best. Pan Am Games silver medallist Rasheed Dwyer, also from Jamaica, is expected to be his closest rival. Great Britain’s Martyn Rooney, Jamaica’s national record holder Rusheen McDonald, his fellow countryman Javon Francis, Belgium Kevin Borlee and USA’s Vernon Norwood are all listed for the men’s 400m.